Went for their latest Dinner Set Menu Special Deal from Dimmi.com.au – it was delicious! A 4 course meal for $40 – essentially $10 per dish. Great interior. Dining area is spacious and have catered for all group sizes. The mocktail, Masquerade, $9 attracted both couples on our double date; Orange and Pineapple juices shaken with hibiscus and elderflower. The sunset colours look amazing. It stayed this colour for the whole time. The hibiscus flower was camouflaged at the bottom of the cocktail. Tropical in flavour and the edible hibiscus was sweet and very pretty. Their Fried Squid is one of their dishes I’d remember for a while. It was accompanied with squid ink aioli and capsicum pickle. Lightly battered and the flavour brought out the sweetness from the squid. It was tender and the capsicum added a little spice feel. Aioli was light and delicious when dipped with the squid because the squid was sufficiently flavoured. The dairy-free option was without the aioli. 2nd came Venison loin carpaccio, celeriac, slaw and salsa verde. It looked light but after digging into the dish I felt that there was a lot of Venison. It was never ending! I loved the slaw and celeriac – a good combination of fresh flavours and texture. Salsa verde was light but wasn’t the star for me. The dairy-free option was without the slaw. 3rd dish is Hunter’s Cut – MB6+, 450D Wagyu rump served with American style mac and cheese. The steak was a good size for us girls – I actually couldn’t finish it as the cut was slightly thinner (first photo) than the boys one (second photo). So it was a bit over and chewy as it cooled. Nonetheless, the boys cleaned it up. Mac and cheese had the right portion but I felt the cheese was a bit powdery – I don’t know what happened there. It wasn’t a creamy / cheesy mac – is this what American Style Mac and Cheese is like? Dairy-free option was salad instead of the mac and cheese. 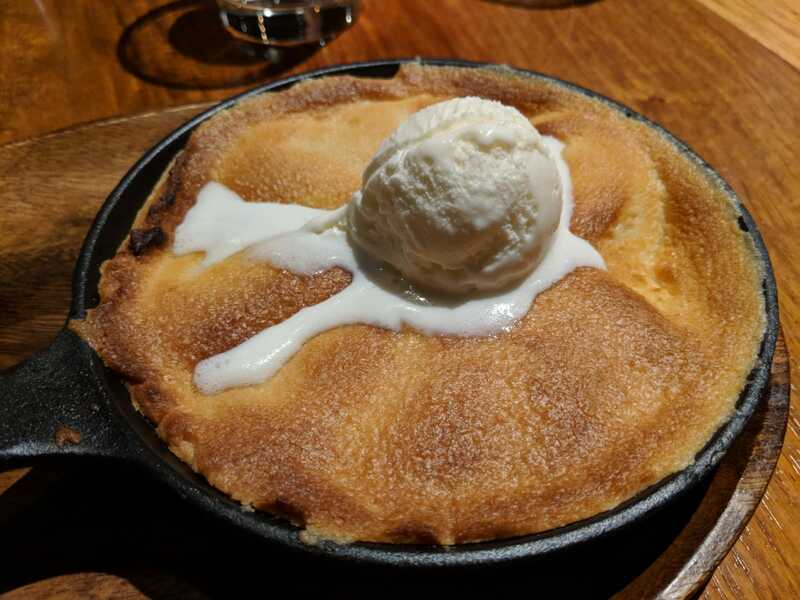 Lastly, we had the Peach Cobbler, in orange syrup baked in a skillet with fior di latte ice-cream on top. It was DELICIOUS for a winter’s menu. The skillet came very hot but the perfect temperature when getting a spoonful of the cobbler. The outer surface was very crispy and soft inside. The sweetness was just as I desired for a dessert and the peach was punchy and fruity to cut through any sugar in the baking. Overall, service was great – we had a great double date accompanied with good food with fabulous value – I’d revisit again! I’d recommend their specials. Please note that the deal may no longer be available but I know their fried calamari is on their menu and is combined with their current lunch deals.